Even though we speak about how much FUN the F.O.S. ( Freedom Of Speech TM) Fashion Frame can be, it can proudly BE A PLATFORM TOOL FOR MANY IMPORTANT CAUSES or relevant MESSAGES we as a national or global society may want and NEED TO RELAY for various concerns to others. Take the Purple Pledge during Alzheimer's and Brain Awareness Month this June . 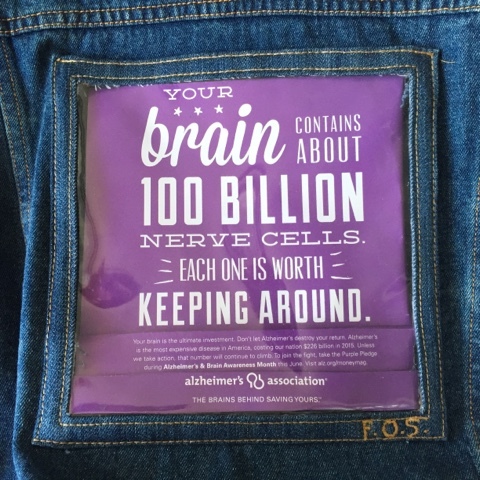 Visit Alzheimer's.org/moneymag For all those skeptics & non believers who don't feel consumers and Americans have any use TO WEAR ADS FROM NEWSPAPERS OR MAGAZINES, think how beautifully this Ad was done and how useful it could be if we consumers republish it in our F.O.S. Fashion Frames or wherever one desires TO DISPLAY IT.